As I walked up a steep hill I took the time to feel the warm sand beneath my toes as I took each step. When I reached the summit, I pivoted and marvelled at the scenery before my very eyes. Panoramic views of jagged rock formations on a bed of sand left a lasting impression. Each rock formation was so distinct it appeared it had been individually hand carved by an artist. I snapped a few photos and then I put my camera down and sat down in awe – some places are just worth the extra attention. 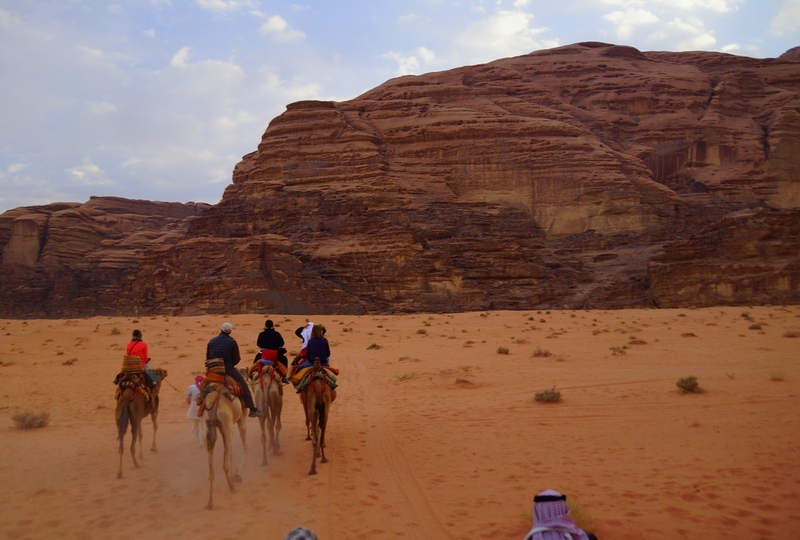 Visiting Wadi Rum was one of the true highlights of our journey to Jordan. Known also as The Valley of the Moon, its name derived from the Aramaic root of ‘elevated’ and has been inhabited by many human civilizations over the years – most notably the Nabateans. 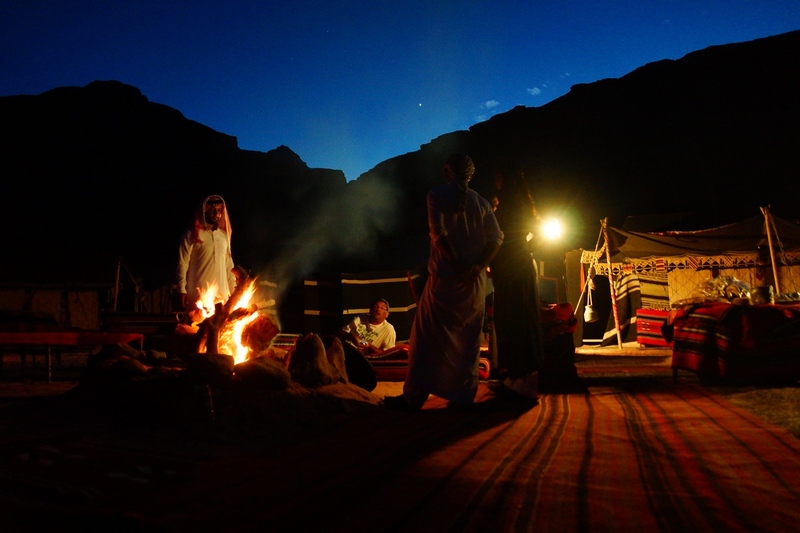 Home to the Zalabria Bedouin, the region is one of the most popular eco-adventure tourism spots in all of Jordan. From treks to camel safaris to cultural experiences there is something for everyone to enjoy. 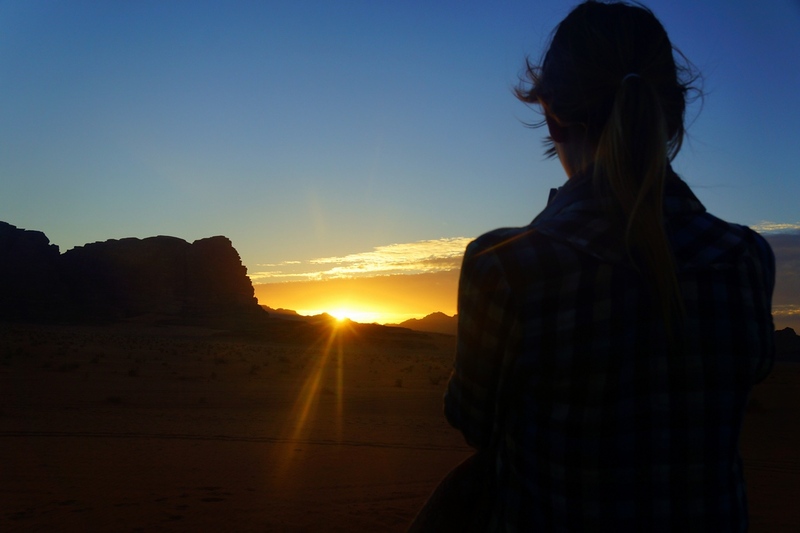 This is a sunset shot from our Wadi Rum tour where Audrey is rendered as a silhouette. Our guides specifically took us to this particular point roughly half an hour before sunset. We certainly were not disappointed. As a travel photographer it is paramount to look back every once in a while. This particular shot was taken from the back of our pickup truck after it stopped for a few minutes. Looking back I noticed the spectacular cloud formations in the sky. Here a Bedouin man puffs smoke out of his nose just outside of tent in Wadi Rum. Smoking hookah, know locally as Arghila or Shisha, is very common in Jordan. You can select tobacco with an assortment of different flavours. My personal favourite is apple mint. 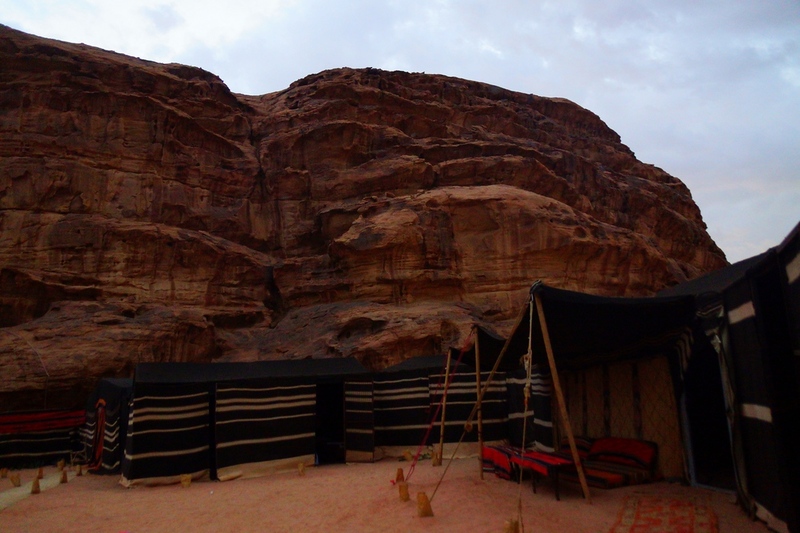 Sleeping in a Bedouin tent was one of the top highlights from my time visiting Jordan. Here a group of Bedouin men prepare a camp fire at night that would later be used to serve tea. 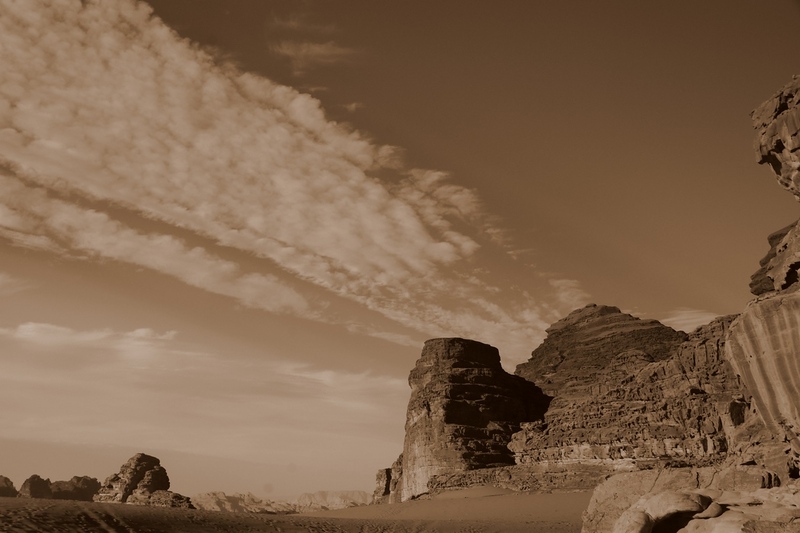 This is a shot of Seven Pillars of Wisdom Mountain in Wadi Rum, Jordan taken just after lunch. Can you spot all seven? 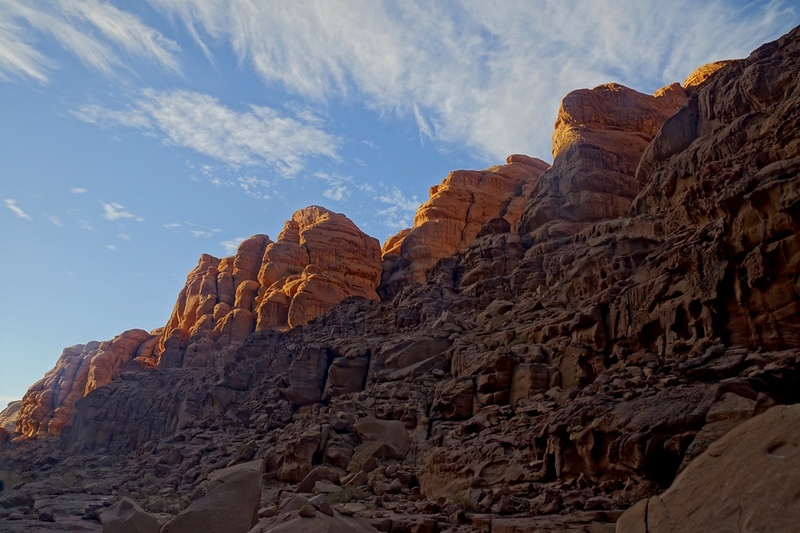 The rock formations are especially impressive at Wadi Rum. I’m not a huge fan of HDR photography but I found myself taking several of these types of shots given the contrast between harsh shadows and light. 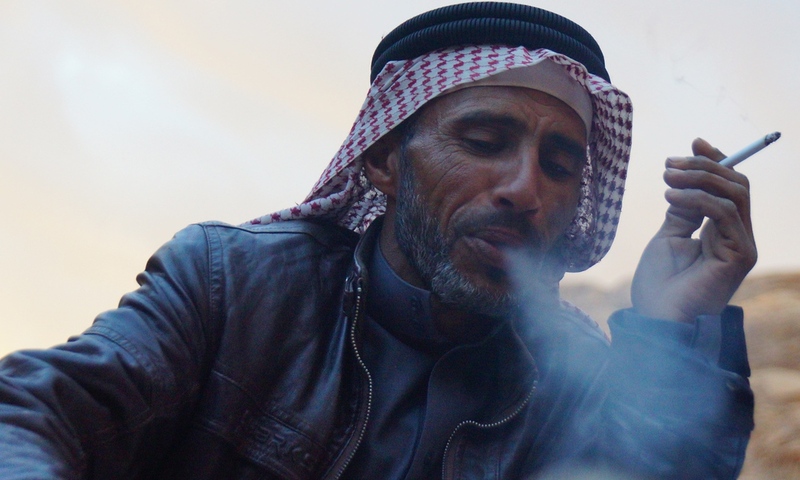 A Bedouin man puffs exhales smoke from a cigarette nearby our camp in Wadi Rum. 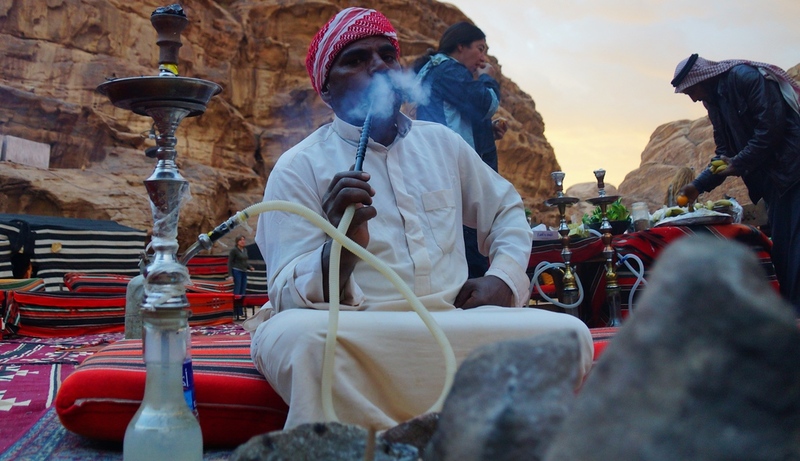 This is another shot of the same Bedouin man from the third photo in this gallery smoking Hookah. In this particular photo you can clearly notice the smoking device and rock terrain in the background. 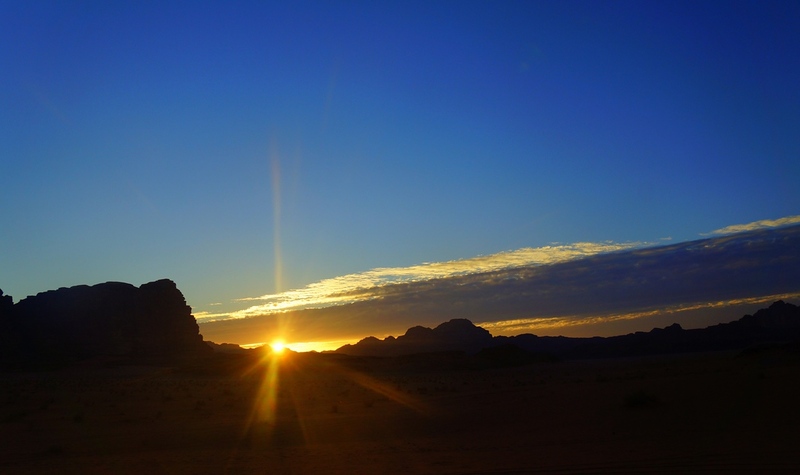 This is a photo rock formations during a spectacular sunset in Wadi Rum. As a travel photography tip, it’s a good idea to not only focus on the sunset. Look around and you’ll often notice other subject areas worth shooting. 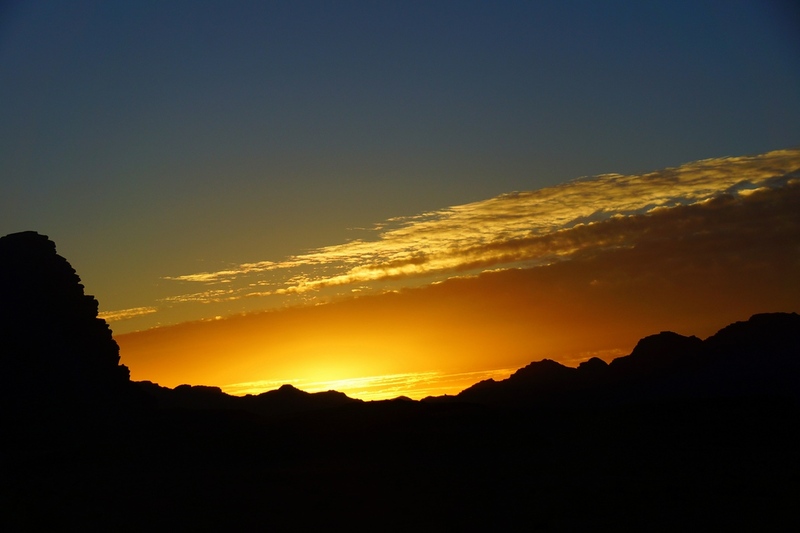 This is a telephoto shot of rock formations during sunset in Wadi Rum, Jordan. This is a travel image of Audrey Bergner riding a camel for the first time. She did remarkably well and looked rather graceful for somebody with very little experience riding animals. This is an action shot of a Bedouin boy and Dustin Main riding camels in Wadi Rum, Jordan. You’ll notice Dustin wielding his dSLR camera in his hands. He took a lot of photos of our group which we greatly appreciated. This is another perspective shot of rock formations during sunset in Wadi Rum, Jordan. This was the nicest sunset we witnessed during our entire time in Jordan. I was a little under the weather at the time and having an opportunity to lounge by the camp fire prior to going to sleep was the coziest option at this Bedouin camp. In this photo you can notice several mattresses that were used to sleep on around the camp fire at night. 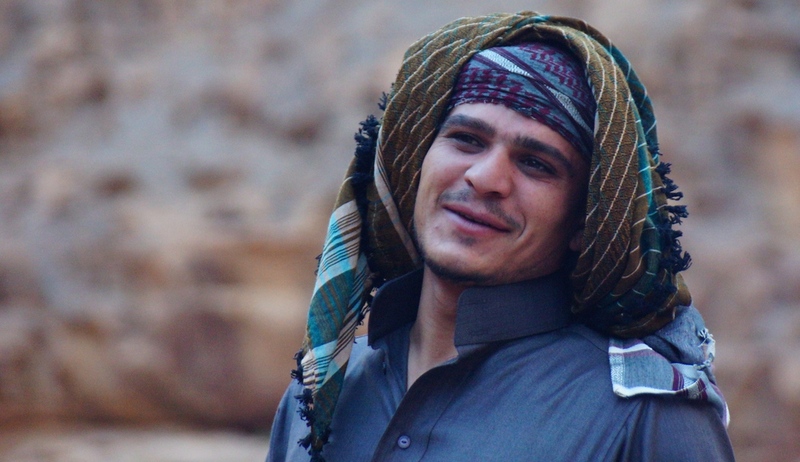 This is a candid portrait of a Bedouin man smiling early in the morning before breakfast. Here is another group shot of us riding camels. Can you spot Audrey? 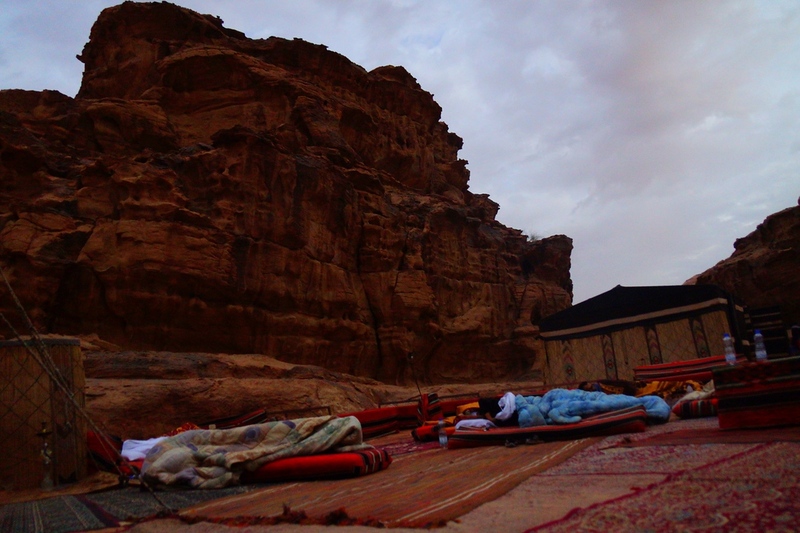 Here is a photo of the tents we used while camping overnight with the Bedouins in Wadi Rum, Jordan. Inside our tent were sample mattresses, warm blankets and candles. 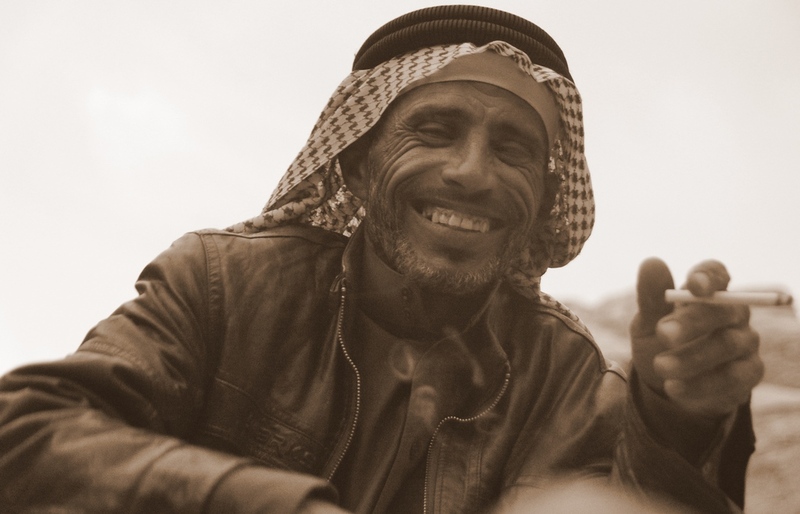 Here is a candid shot of a Bedouin man smoking a cigarette and beaming an even more impressive smile. One last scenic shot from Wadi Rum, Jordan. hmmmm this photogenic man convinced me to try smoking hookah when we get the chance… I don’t smoke but I’d like to try hehehehe. Love the clouds in the photos, spectacular shots. Oh, it’s a lot of fun apol! i love to write on travel blog and i appreciate your your post for it’s unique photos around the world. Hahaha, pure pain indeed. Whenever I ride a camel it’s always the same score: Camel 1, Sam 0. Great to discover your blog recently as well. Photography is something that can be learned at any age. I didn’t really start getting into it seriously until 4-5 years ago. Amazing shots. Anyone else wondering when Indiana Jones was going to pop out? Wonderful shots! Brings back a lot of great memories from my visit. Incredible locals in an incredible part of the world. I completely agree with you. As amazing as the attractions were in Jordan it’s the people I’ll remember the most. Awesome stuff! The landscape looks incredible. It truly is an incredible landscape! Great photos and the videos give a sense of being there. Nice! We’re sure missing being there these days. That looks like an incredible experience. Jordan has such a rich history. I love the sunset picture! What an experience and stunning photos guys. 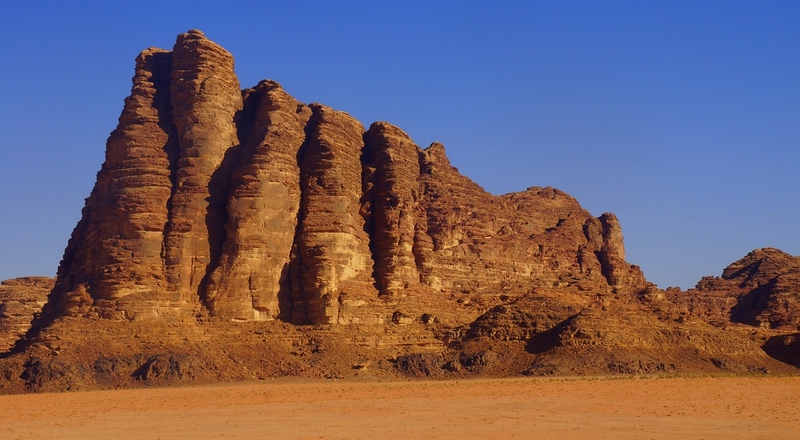 I have heard there is good rock climbing in the Wadi Rum – the pics of those crags have me itching to get there! Glad this post brings back the memories. I’m really itching to get back there myself. 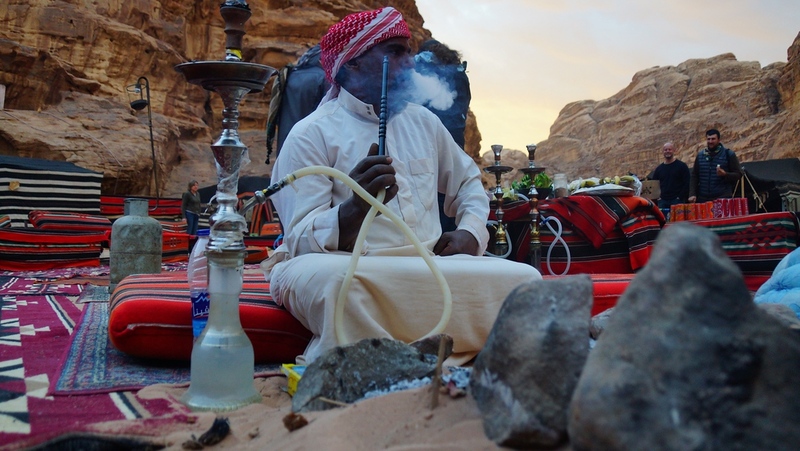 Unbelievable place though, loving the pictures you got of the Bedouin with their Shisha! Wonderful photos! Wadi Rum is truly photogenic! I certainly think it’s safe for women to travel to Wadi Rum. If you stay in a camp you’ll be surrounded with other travelers and the Bedouins are very kind and generous hosts! Now on my list to do!! It’s a country that I hope to revisit as soon as possible! Those rock formations are amazing! I’ve never gotten to spend much time in a desert, but I would love to check out a place that beautiful. 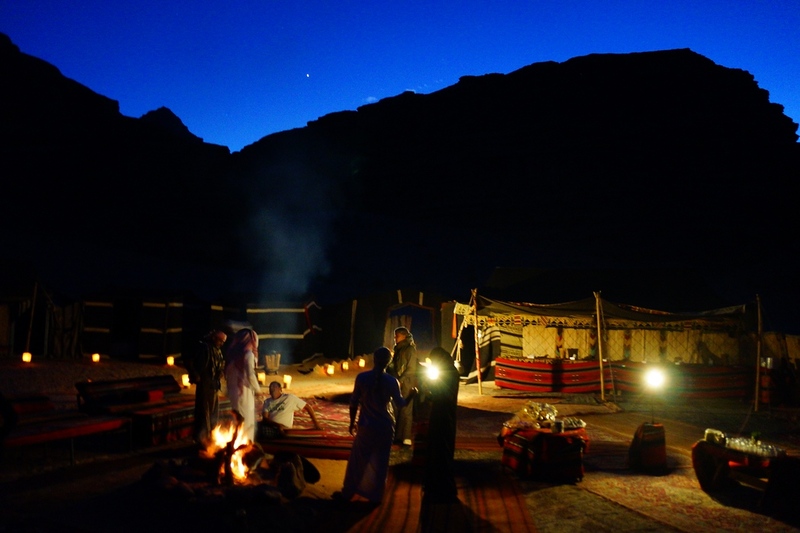 Getting to spend the night in a bedouin tent seems like a great way to experience the culture. Wow, always blowing my mind with some powerful photography. Still working on my fear of photographing people and offending them. I’ve gotta’ get over that or not be shy to ask. Great stuff as always Samuel. I felt the same way as you do now. I’ll be honest that sometimes I do get caught taking a shot and it is a bit awkward but that doesn’t happen very often now with practice. Great pictures! I’ve only visited Jordan for a few hours because it was on a stopover on one of my flights. These pictures really make me want to go back to Jordan and discover the rest of the country. Thanks for inspiring me! What a truly mysterious place! Love the photos and definitely love the blog entry! Awesome pics! I slept with the Bedouins too when I went on birthright. Only problem was they ran out of space with our big group so I ended up sleeping right on the dirt in my sleeping bag. Oh well, I actually slept better than I had in months! Jordan is way up there on my “to visit list”. Looks amazing. Great pics Sam. I absolutely loved this post and your gorgeous images! You do a brilliant job of capturing people looking luminous, alive and engaged as well as in sharing the experience through your phoyos as well as your ever amazing videos! I hear you about wanting to revisit great places. 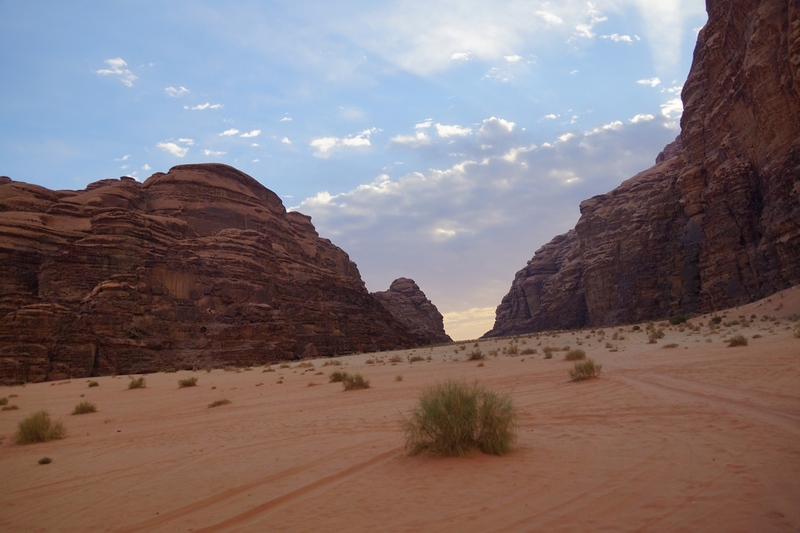 Great post, Wadi Rum was the one place we didn’t visit when we went to Jordan….maybe next time !! 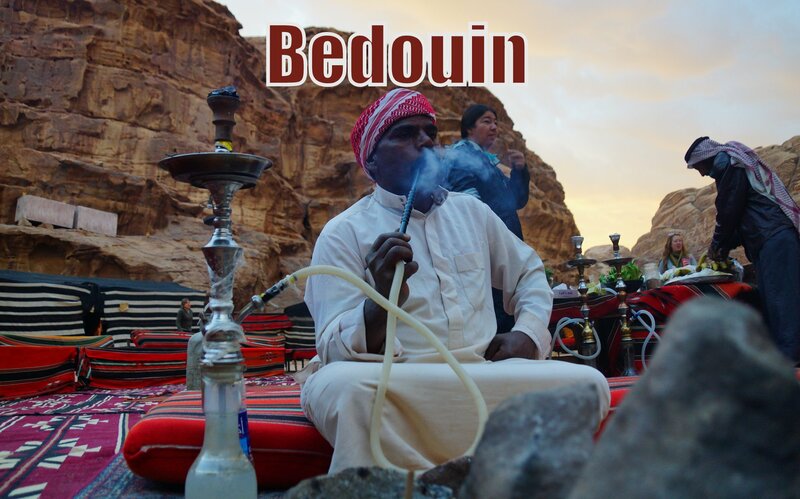 Luv the Bedouin photos! Though don’t think we could sleep in the tent :-). Need our hot shower! We stayed at the Kempinski in Aqaba – but admittedly it was a one-hour drive to Wadi Rum (so much more convenient to stay in the desert). WOW– Amazing photos and adventure! Riding a Camel in Jordan seems to be a very interesting activity. Here we go again, you’ve sparked my imagination and creativity with your photos and video but my favorite is of Audrey watching the sunset. Wow! It’s my favorite shot as well. I hope we can witness many more sunsets like that in the future. Love the portraits. I found the people in Jordan to be some of the friendliest on the planet. Loved Wadi Rum. Excellent photography as always Samuel! Gorgeous photos and video! We’ve skipped Jordan quite a few times, but this post is making me question my priorities. Good luck! Some truly fantastic shots! That guy w/ the cig has such an awesomely genuine smile. Wow. I HAVE to get to Jordan some day. What a beautiful place. Thanks Carmen! I sure hope you can go soon. I’m already thinking about when I’ll be able to head back again.